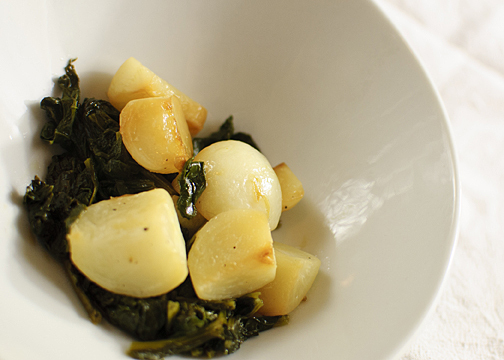 I love fresh turnips cooked with their greens, so good and so good for you. Here’s my favorite way to cook them that I discovered partly by forgetting I was cooking them. Trim and slice turnips in half, quarter if they’re large turnips. Trim the stems off the greens so you have mostly the leaves left and roughly chop. Put greens in good size cooking pot with a lid and put in about 1/4 inch water and drizzle lots of olive oil on top. Add 1/2 teaspoon salt and freshly ground pepper. Cover and turn heat on high. Cook until the water boils and the greens start to soften, about 5 minutes. Add turnips, cover and reduce heat to medium. Cook for another 5-10 minutes and check to see how much liquid is left. You want to cook until the liquid is gone and the turnips start to lightly brown in the oil. If there’s a lot of water left, crack the lid a little so the liquid can evaporate and keep cooking. Don’t stir too much, if you’re cooking something else, turn the heat down and leave to cook for longer, but the turnips should be nicely carmelized and ready to eat after about 15 minutes total cooking time. This entry was posted in Posts, sides and tagged turnips.